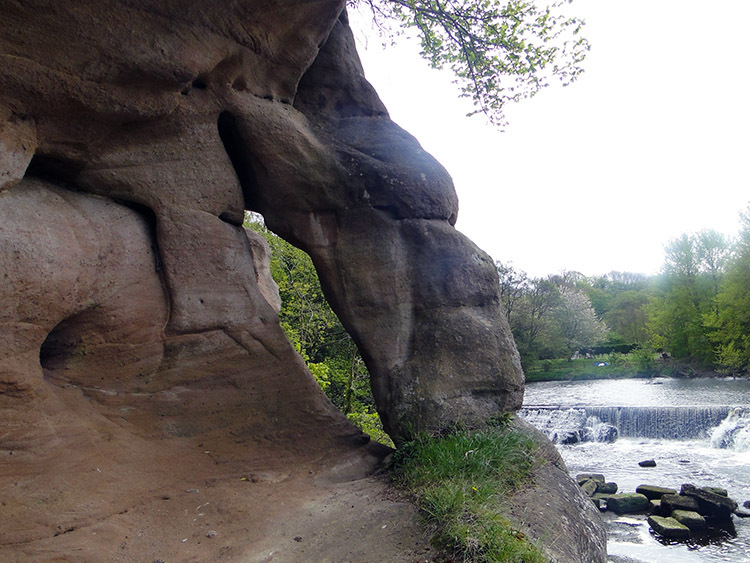 Summary: The Knaresborough Round is a well established circular route passing through the Nidd Gorge and a succession of villages which surround the historic town. 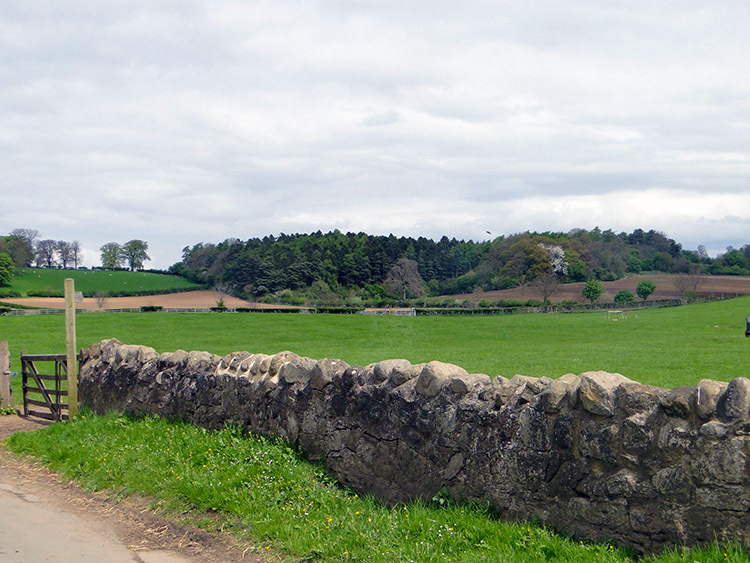 The walk can be divided into two stages or linked with the Harrogate Ringway to form a very challenging 36 mile route. I had been intending to walk the Knaresborough Round for some time but had never got round to it, putting it off for one reason after another. Three years on from completing the neighbouring Harrogate Ringway it was Spring 2010 and I finally decided to get on with it. After a couple of false dawns because of weekend restrictions and the weather I, along with brother Dave, my regular walking companion set out to do the deed. Unlike the Ringway which was completed in one day and with some fatigue we decided to do the Round over two weekends with the first leg distance decided on a 'see how we feel' format. Thus we set off from Forest Lane Head between Starbeck and Knaresborough not knowing where we would end up. But with my mobile phone and Lil with car to pick us up at our disposal we set off in good spirits. So, how far would we get? As we set off from Forest Lane Head the first part of our walk was familiar. 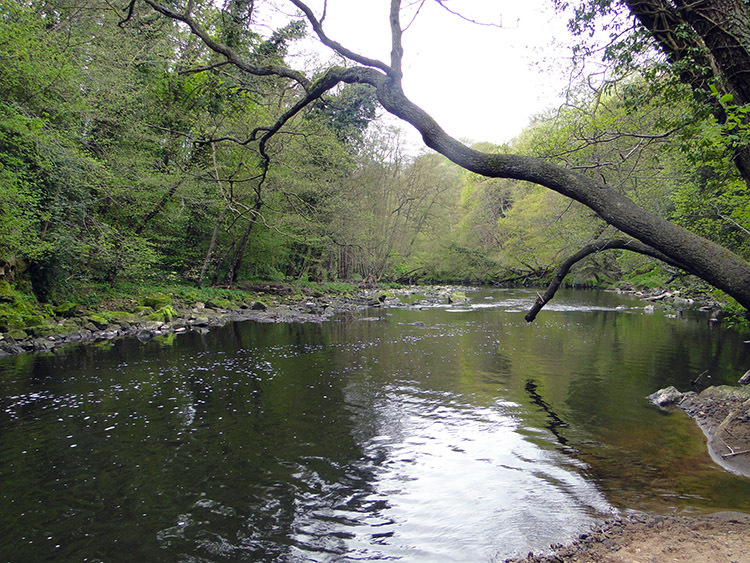 It took us into Spring Wood and towards Bilton Banks, a favourite part of the Nidd Gorge near Scotton Banks. This stretch of the Knaresborough Round also serves as part of the Harrogate Ringway so we had walked this part before, but the woods and gorge are lovely so it was, as always, a pleasurable passage through the woodland and over the river via a footbridge at Scotton Banks. For me the rest of the day was new adventure. Dave had done sections before but not I as we walked out of the Nidd Gorge to Gates Hill and then after carefully crossing the B6165 along a quiet road to Scotton and then onto bridleway and across fields to Lingerfield then Brearton. 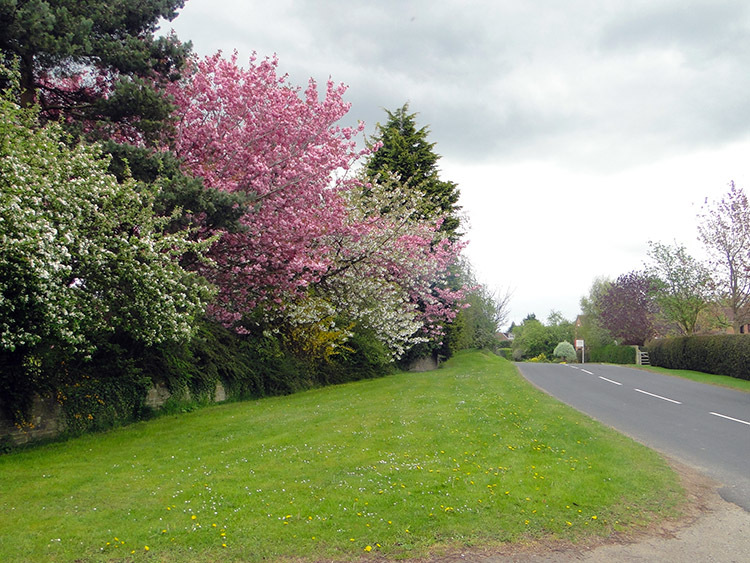 The walking was pleasant through quaint North Yorkshire farming land with sights like spring lambs playing and enjoying their new existence and of a kaleidoscope of colourful blossom from many sorts of trees including Blackthorn, Hawthorn, Cherry, Horse Chestnut and Hornbeam. The familiar spring smells were abounding too, new flora springing up everywhere. At Brearton we took our first break and five minutes after we stopped to do so a group of about 20-30 walkers emerged from the direction we had just walked. Our stop forced them ahead of us and they were soon gone. We had not seen the last of them though. After our break we resumed our walk along a road due east, a very quiet road for along the entire length of it we never encountered a vehicle. 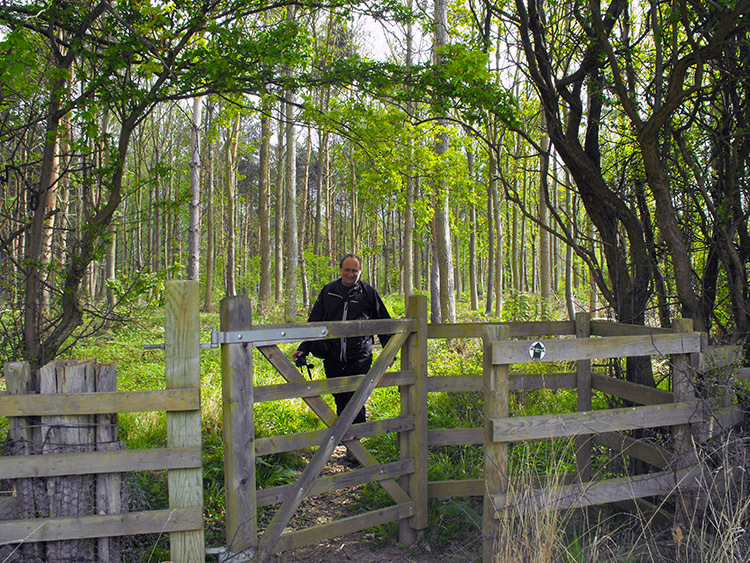 The first part was alongside Jackson Plantation and Rigg Moor Plantation and then we walked to Warren Farm. On reaching the farm the lack of traffic became clear, we had been walking along a dead end road. 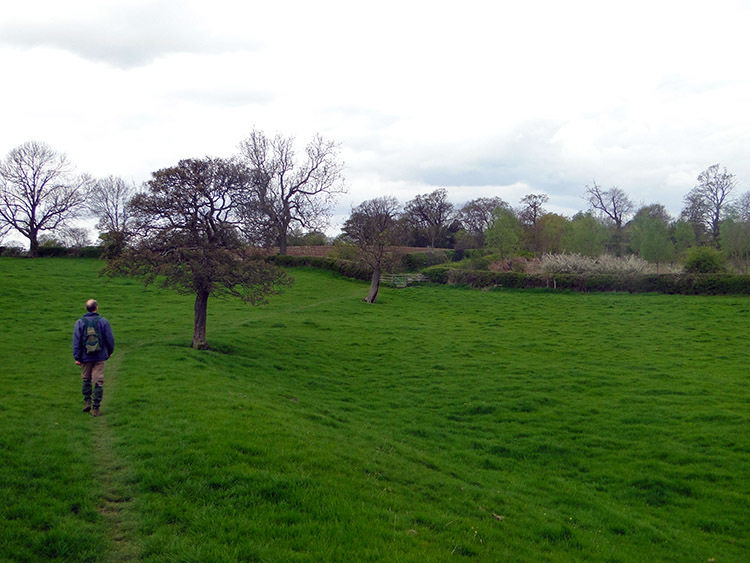 After Warren Farm it was for a short way a bridleway and soon after nothing at all. Without particularly noticing anything we were walking across a field alongside Walkingham Wood. At the end of the field we crossed a stile and then followed a hedged bridleway to Walkingham Hill Farm, stopping briefly to make the acquaintance of some lovely horses and then through the farm which should be described as a stables before walking off the hilltop point which afforded distance views eastwards and down on to Occaney. Occaney is nothing of a place but I am sure it is important to the few who live there, it is a few scattered dwellings at the side of the road linking the villages of Farnham and Staveley. The walk through the place is the least desirable part of the Knaresborough Round for it forced us to follow the busy roadside for 500 metres before we turned left into a field and up skirting Hollins Hill at a heady 54 metres above sea level. The Knaresborough Round is a long walk but not a lofty one. 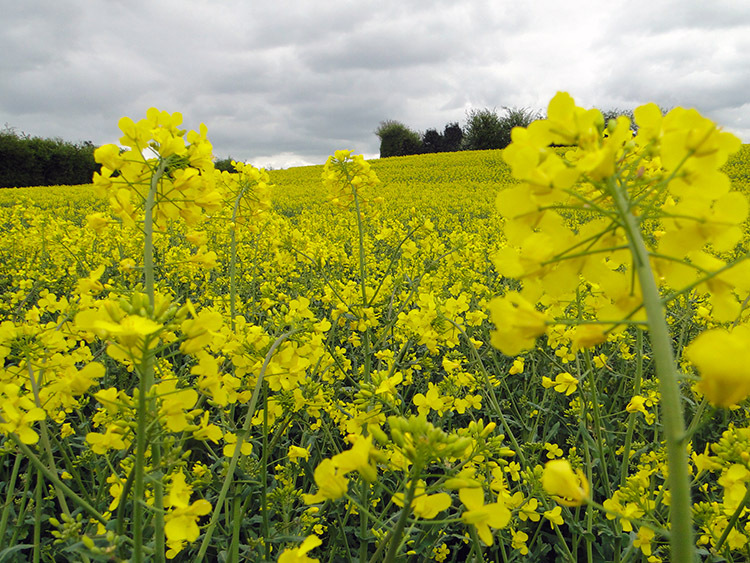 We were now walking in the midst of the glorious yellow flowers of Rapeseed which gave a glow to an otherwise dull spring day. A few colourful fields later we were at the site of an old disused railway line which used to link Knaresborough to Boroughbridge. The line, built in 1875 last served passengers in 1950 and the last goods train trundled along it in 1964. Now the only clues are some raised embankments, some cuttings and the distinct line of the route on Ordnance Survey maps. We walked a short stretch along it before disembarking and crossing a couple of fields to reach the village of Ferrensby. We walked briskly through the village and while doing so we passed the group of walkers we saw in Brearton. It was their time to take refreshment while we overtook. While passing through Ferrensby we crossed the busy Knaresborough to Boroughbridge Road but not until a minute was lost waiting for traffic. Care is needed here, it is a busy road and the crossing point blinds the traffic coming from the right. 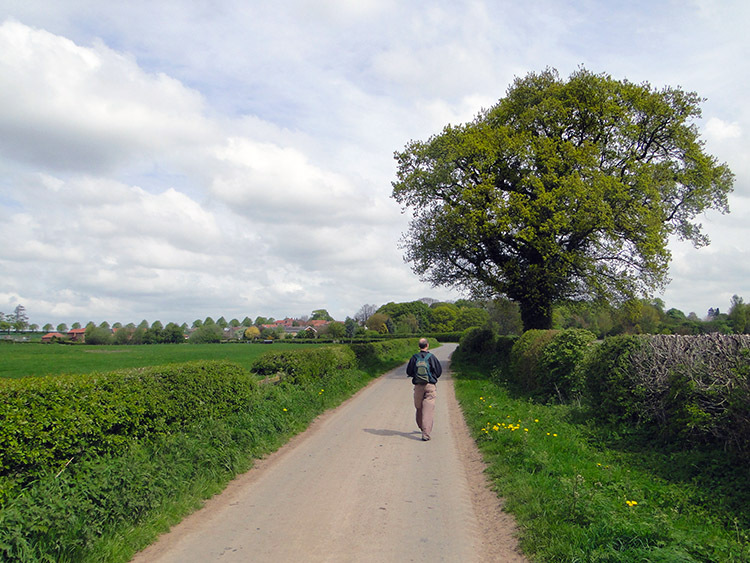 After crossing the road we bounded on towards the village of Arkendale but never reached it as we followed our course onto a bridleway and walking due south to Poplars Farm. 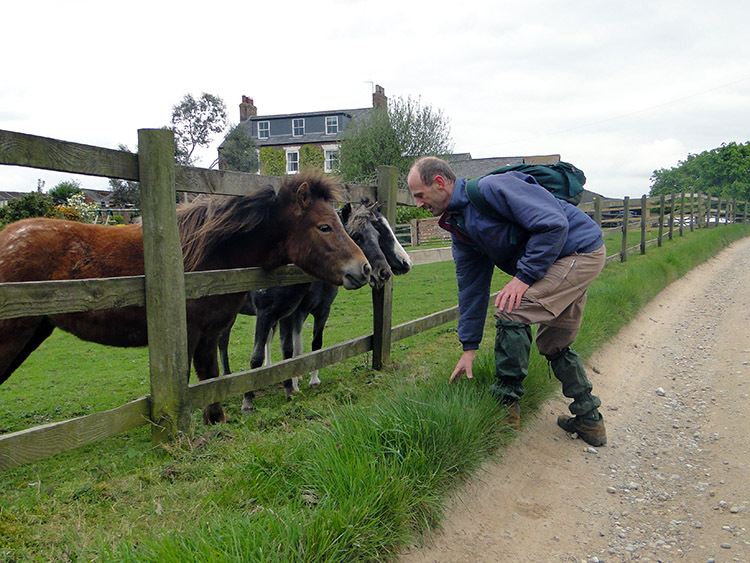 At Poplars Farm we halted for a short while to accommodate very friendly horses and ponies who rushed over their paddocks to meet with us. It was a delightful interlude and we left only after Dave had supplied the ponies with some lush long grass to feast on. From Poplars Farm we made our way on the same bridleway to the Hollies and from there we had a one kilometer long trek over open fields to Clareton Moor Farm. During this boring section, there is no other word for it, Dave and I discussed our halt point for the first stage. We looked at the map and agreed Flaxby. From Clareton we walked though the lovely village of Coneythorpe and then across fields to Flaxby. At Coneythorpe I had mobilised Lil and five minutes after reaching Flaxby she picked us up. On our first part we had done twelve miles, so we had eight to go. Six days later Lil dropped Dave and me off at exactly the same point she had picked us up. Reinvigorated we resumed our circuit of the Knaresborough Round and walked from Flaxby to skirt the Golf Course and then cross the A61. As busy a crossing as our previous toughie at Ferrensby this crossing was easier because of the long straight views both right and left. 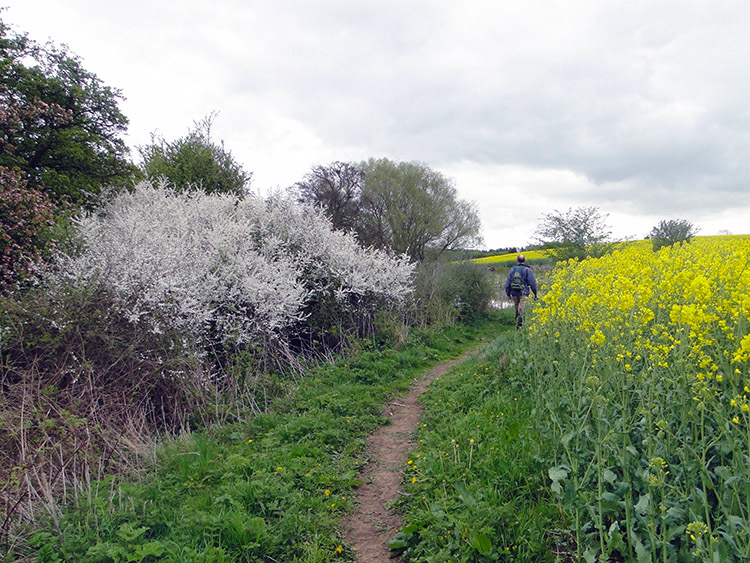 We made our way safely across thanks to good old Tufty's advice and then walked over a couple of fields before crossing the Leeds to York railway line which heralded our arrival at Parsonage Wood. 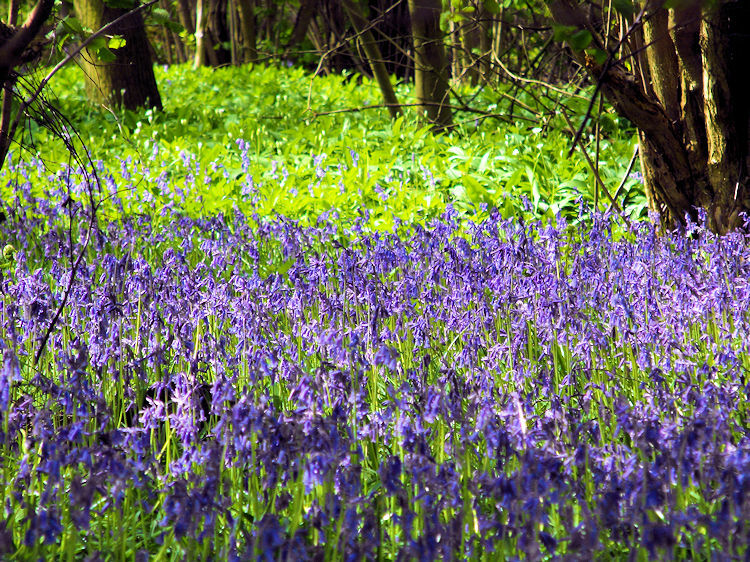 Unlike last week the sun was out with us now and as soon as we entered the wood we were beguiled by the precious blue carpeting of Bluebells and by the delightful odours of fresh spring woodland including the scents of many flowers and the unmistakable smell of Wild Garlic. We were enchanted as we wandered through the woodland and during our transit through the tree lined avenues I walked to within 20 metres of a Hare who was ambling along the path towards me. I stopped immediately on spotting him. For a while he kept coming, oblivious to my presence. Then he stopped and looked at me. For what seemed ages, probably 3-5 seconds we looked at each other without flinching. Eventually and unable to contain myself I turned and waved to Dave who was a short distance behind. I tried to whisper details of the Hare's presence to Dave. Alas the activity spooked the Hare and he turned tail. Dave never did see him. The woodland walking continued to be brilliant. 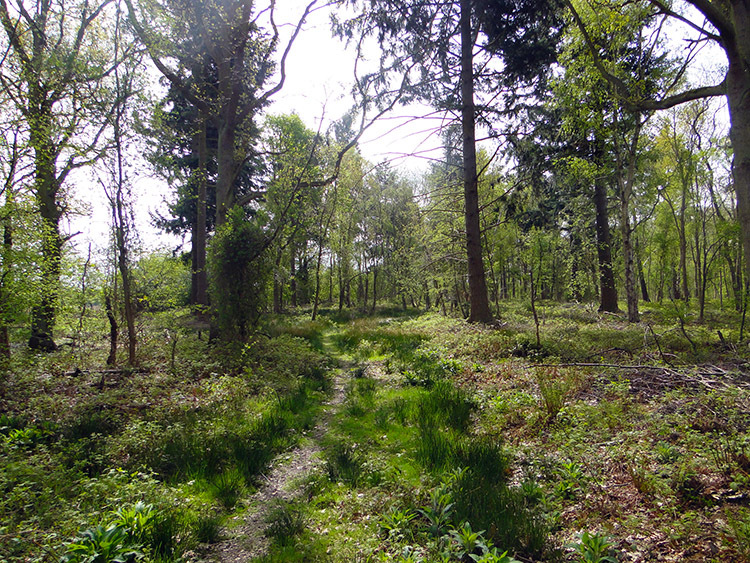 Spring sunshine glistened through the high canopy making the walk through the wood ever contrasting. Purple Orchids were generously interspersed amongst the Bluebells and Primroses were profligate too. It was an incredible experience to enjoy all the woodland flora on such a bright day. 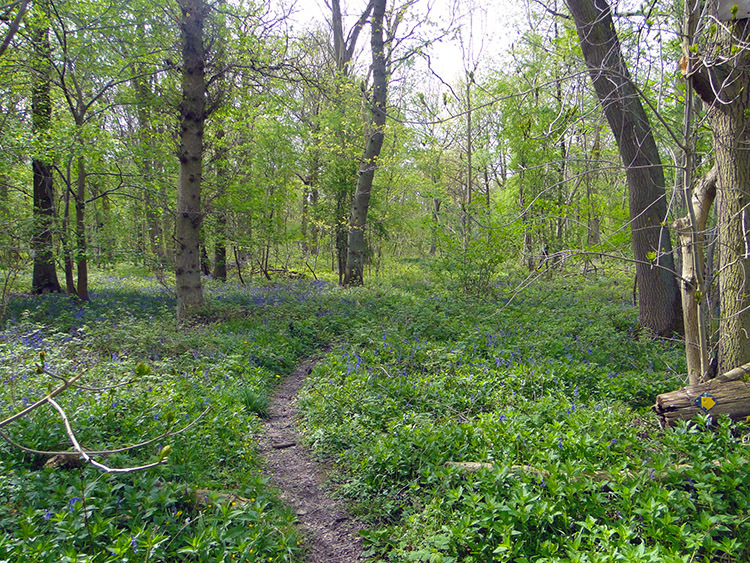 Only reluctantly did we leave the woodland section of our Knaresborough Round walk. It was a real highlight of the walk and one of those moments of our walking lives we'll never forget. The day was not over though and we had more spectacles to come, first one being the village of Goldsborough. 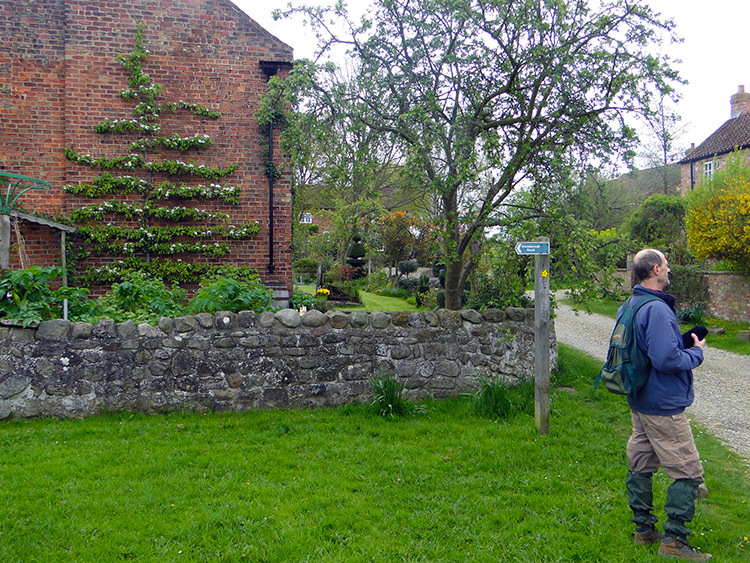 The walk just skirts the village of Goldsborough but we chose to head into its heart for a soft drink at the local pub. As with most villages in North Yorkshire the gardens were meticulously attended and well maintained. Viewing them for free was extremely good value. 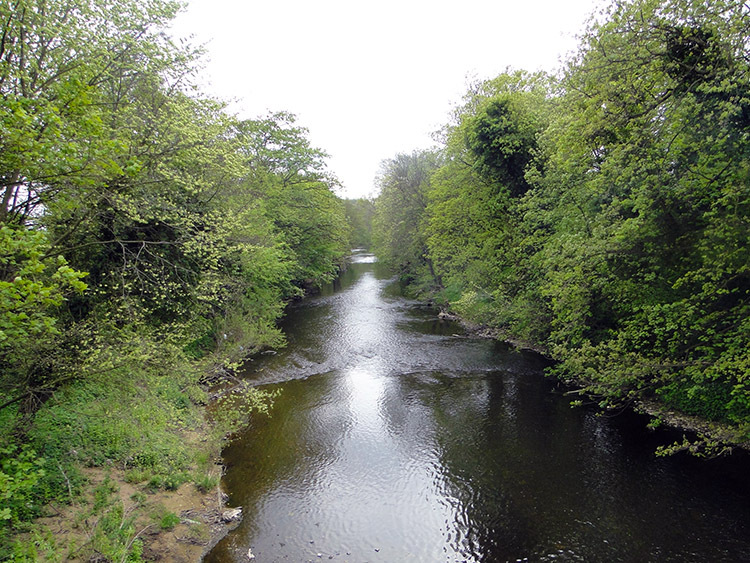 After our refreshment break at the Bay Horse we left Goldsborough and walked on lanes and alongside fields to re-encounter the River Nidd at Goldsborough Mill Farm. Making a brief stop we viewed the magnificent river for a while from a bridge which serves as a Knaresborough access route to the farm. 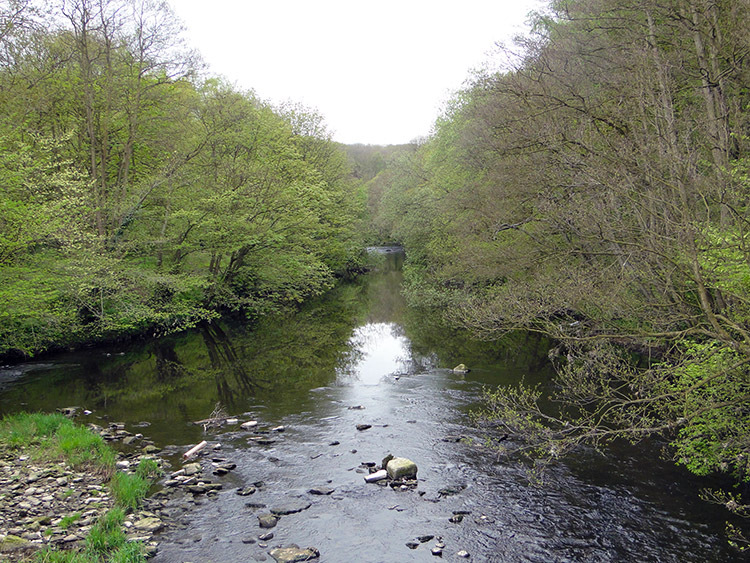 From the bridge we walked a short distance up the track to emerge at the busy A658 which we crossed safely and then we walked to Grimbald Bridge which took us from the noise of the traffic to the noise of the River Nidd. 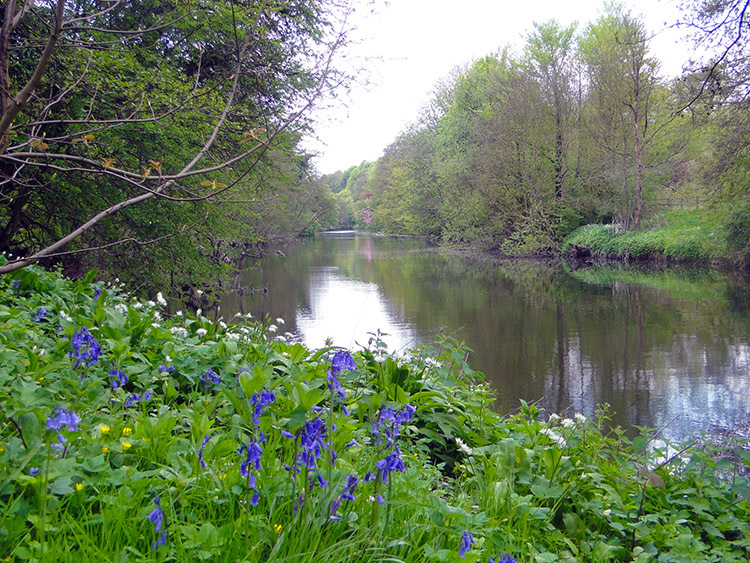 We were now on a spectacular section of walking upstream the Nidd, first quickly past Plompton Mill Farm Caravan Park and then ever so slowly to take in some remarkable views of the riverside at places like the sandstone shapes near the Weir and then in Birkham Wood with more Bluebells to charm us. 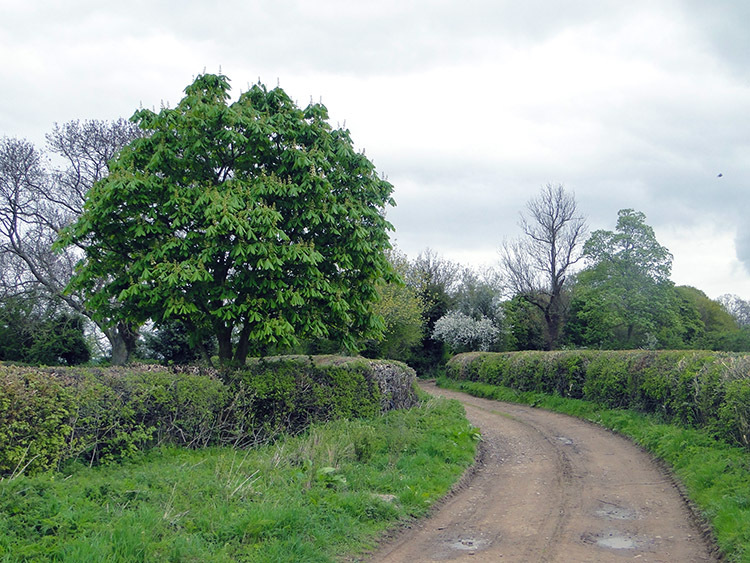 The finale was soon upon us and after emerging from the woodland we crossed some fields near Thistle Hill before crossing the Calcutt Road to reach Gallow Hill before crossing more fields and the railway once more to reach Harrogate Golf Club. Twenty miles were done, the walk complete and highlights stored in the memory. Some like the flowers, the river and the trees I will see again. But will I see the Hare?